Digital Subscriptions > Learn Hot English > 166 > Grape Claim! Read over the two stories above about crazy lawsuits. Which one is the most ridiculous? Why? You are going to listen to a conversation about another strange lawsuit. Listen once and answer this question: Why is the man suing the shop? Listen again to complete each space with the correct missing words. The latest issue of Hot English (166 – the March issue) is out now! Learn over 300 useful words and expressions and improve your listening skills with Learn Hot English! 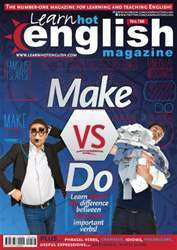 This month: Learn about the difference between the verbs “make” and “do”. Plus, 10 useful words for describing clothes accessories, 15 home-repairs useful expressions, 8 useful expressions phrasal verbs for talking about sleeping or waking, 8 idioms for talking about the home, 8 useful travel words... plus: •	Sport – the Rickshaw Run. •	Music – traditional English songs. •	Games – wordsearch and crossword. •	Fun – useful trivia. •	Crime – corny criminals. •	Grammar – communication verbs. •	Football – the European Championships. •	Weddings – wedding films and unusual weddings. •	Anniversaries – what happened in March. •	Britain – tea rooms. •	Justice – famous prison escapes. •	Conversation – bar chats. •	Language – learn how to speak “Janglish”. •	Humour – the Chap Olympics. AND LOTS, LOTS MORE! By reading and listening to all this great content, you'll improve your English reading and listening skills and learn up to 300 useful words or expressions. Plus, you'll get a better job and pass English-language exams more easily. Guaranteed!